Posh chairman Darragh MacAnthony (left) and manager Darren Ferguson in 2014. Peterborough United manager Darren Ferguson has committed his immediate future to the club by signing a three-year contract today (March 20). Ferguson replaced sacked manager Steve Evans on January 26 after initially agreeing to do the job until the end of the current campaign. Assistant manager Gavin Strachan has also signed a deal until 2022. Posh manager Darren Ferguson (left) and Gavin Strachan. Posh have lost six and won just two League One matches since Ferguson replaced Evans. Posh have lost their last three matches and dropped to eighth place ahead of a home game with Southend United on Saturday (March 23). But the Posh owners are convinced Ferguson is the best long-term choice to lead the club back into the Championship. Ferguson has won three promotions and secured a Johnstone’s Paint Trophy win in two previous spells as Posh manager. Co-owners Darragh MacAnthony, Stewart Thompson and Dr Jason Neale issued a statement which read: “It was vitally important that we appointed a manager that we can trust and who understands our core philosophies as a club. 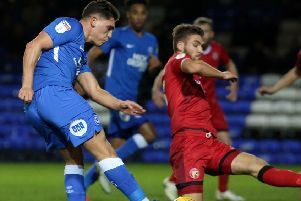 The style of play, production of young players and taking on young and hungry talent and developing those players is what Peterborough United is renowned for and in the last 18 months we have veered away from that. “Our investment in the Academy, training ground and stadium continues to happen and we will of course invest in the first team squad both on a short and long term basis to give Darren all the tools necessary to make us a successful football club once again. This week Posh announced they have introduced a plan to ensure at least three players graduate from the club’s Academy to the first-team squad every season from 2024 onwards.